In commemoration of the International Day to End Violence Against Women (IDEVAW) on November 25, women artists, human rights activists and poets joined relatives of political prisoners in mounting a benefit exhibit of portraits of women political prisoners in the Philippines at the Conspiracy Bar in Quezon City. The Kababaihan sa Sining at Bagong Sibol na Kamalayan (Kasibulan)–an organization of women artists, human rights group Karapatan, poets from Kilometer 64, and relatives of political prisoners under Hustisya, opened the exhibit Wednesday with nineteen (19) portraits of women political prisoners. Volunteer teacher Rhea Pareja, elderly Moreta Alegre, youth activist Maricon Montajes, women’s rights advocate Rosanna Cabusao, and National Democratic Front of the Philippines peace consultants Wilma Austria, Ma. 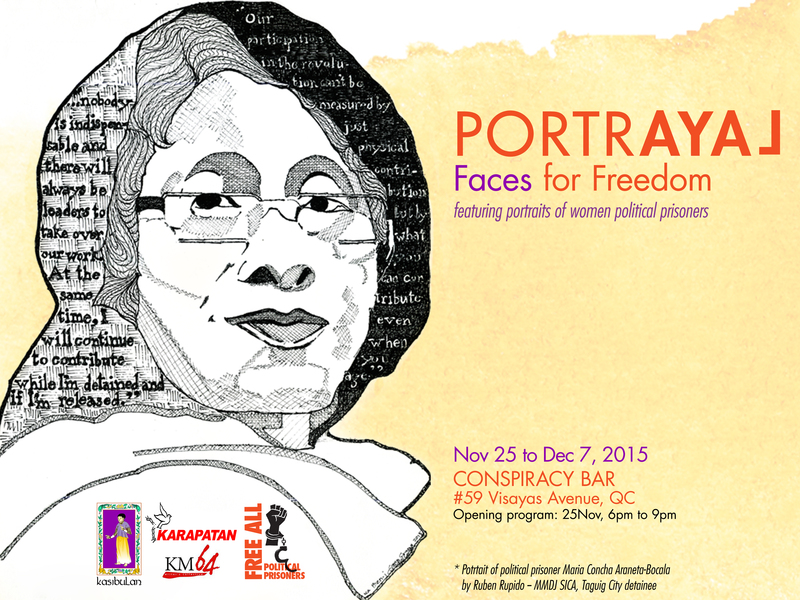 Concepcion Araneta-Bocala and Loida Magpatoc, were among the women political prisoners featured in the portraits. As of September 30, 2015, there are 51 women political prisoners in the Philippines, out of the 555 political prisoners. Political prisoners are individuals illegally arrested and detained based on their political beliefs or affiliations. Fabricated criminal charges were filed against them. The benefit exhibit, which will run until December 7, is part of the continuing efforts to raise awareness and resources for the campaign to free political prisoners in the Philippines. The organizers said the exhibit was also opened in time for the UN-declared IDEVAW, in commemoration of the death anniversary of the Mirabal sisters in the Dominican Republic who also became women political prisoners during the military dictatorship by the Trujillo regime in the 1950’s-60’s. The Mirabal sisters – Patria, Minerva, and Maria Teresa – were called “Las Mariposas” or “The Butterflies,” among the members of the resistance movement in the Dominican Republic. This entry was posted in Advocacy, Human rights, Inspirational, Press release and tagged art exhibit, faces for freedom, political prisoners, rights activists, women artists on November 27, 2015 by Yami.